The Alexandrine Parakeet, like most of the ringnecks, is a very striking bird. The two Alexandrine Parakeet pictures on this page show the differences in feather coloration characteristic to the ringnecks. Once they have finished their second full molt, the male will have the colored ring going around his head which immature males and females will not have. The Alexandrine Parakeet is found in Ceylon, eastern Afghanistan, western Pakistan, through India to Indochina, and the Andaman Islands. They live in lowlands and wooded areas such as forests, jungle, and coastal mangroves. The Alexandrine Parakeet belongs in the Psittacula genus, that are known as Ringneck Parakeets. This genus has the distinguishing characteristic of a colored collar going around the head in the males, or a pronounced stripe running through the chin area. The Alexandrine Parakeets have a large head and bill, a sleek body and a long tapered tail. The male has a general green plumage with some grayish-blue on the cheeks and a dark purple-red patch on the wing. There is a faint black stripe from the cere to the eye, a black stripe across the lower cheek, and a wide rose-pink collar. The inner tail feathers are bluish-green with light yellow-white tips and a yellow underside. The beak is a deep red with a paler tip. Their average lifespan is 40 years. The female is lighter than the male. Females don't have the rose-pink collar or the black stripe across the cheek patches, and they have shorter central tail feathers. These birds grow to a length of 23" (58 cm). In the wild, Alexandrine Parakeets eat a variety of seeds, fruits, nuts, blossoms, leaf buds. In addition to these foods, you can offer them vegetables and commercial pellets. They like nuts with the shells cracked, such as walnuts, pecans and almonds. They also enjoy the same nutritional foods humans eat, including cooked chicken. Cooked beans, rice, and grains are also enjoyed, but soft foods like these will spoil in about 4 hours. A a roomy cage is required as these are large parakeets. In the wild, these birds live in small flocks during the day, and roost in very large flocks at night. See About Parakeets: Handling and Training for detailed information. Parakeets are very energetic birds! Besides flying, which is important for all parakeets, these birds love to chew! Be sure you provide them with lots of assorted toys and wood chews, perches and swings. Unlike many parakeets, the Alexandrine Parakeets do not bond with a mate for life. Each pair will need two nesting boxes to choose from with wood shavings as a bedding. Once the nest box is selected the female will lay two to four eggs. Both parents will sit on the eggs. The young leave the nest about six weeks after hatching. The males don't reach their adult plumage until the second year. These parakeets have a loud call. 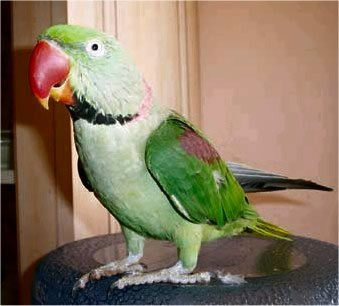 Alexandrine Parakeets are available from time to time, usually from breeders. hi. i have a 3-4 years old alexendrine parakeet male. He sometimes continuously raised his head upward and just rotate it from side to side. plz tell me whats the reason behind it bcz i purchased it from someone, i asked him also, but he says me that it is not problem, it is there natural behaviour. plz guide me. I tend to agree with the person you got it from... natural behavior and not a problem. Sometimes my Alexandria will also behave like this. Its a normal behavior nothing to worry. Do not try to put them in the same cage right away.Put them in seperate cages side by side for at least a month or until they act like they are interested. At that time move them a little closer.Not where they can "touch" each other. that is How I put my 2 cockatoos together. I have 3 and a half months old alaxandrine parrot but in the last 3 weeks he refuse to eat and he also looks very week.he eat some seed but its stomach looks empty and he also refused handfeed . what i do. Would Be Interested In Purchasing A Pair Of Alexandrine Parakeets? Can You Place Me In Contact With A Reputable Seller?